Prudence Says: Know your fiduciary responsibility! Fiduciaries have a tough job. They are legally responsible for the oversight and operations of health plans. To do that they often rely on a team of "ABCs" (Advisors, Brokers, and Consultants). However, the training that fiduciaries and their ABCs get is usually separate, limited, and from different sources with a perspective that is not specific to the plan responsibilities they share. Health Decisions has launched a video series to help bridge that gap in shared, plan-focused training for fiduciaries and their ABC teams. We call it "Prudence Says." Each YouTube video runs 3-4 minutes. 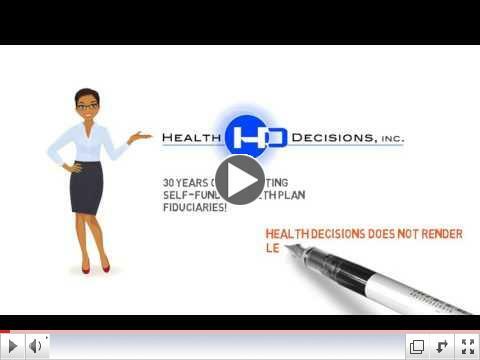 The videos are educational (not sales) but they have a point of view that comes from what Health Decisions has seen over its 30+ years of working with fiduciaries and their ABCs. The videos are designed to be something we hope you talk about, share with your colleagues, discuss, and consider how it applies to your plan. We welcome all feedback, including suggestions of topics we've overlooked. We consider the "Prudence Says" video series to be an ongoing project guided by viewers. Please let us know what you think!